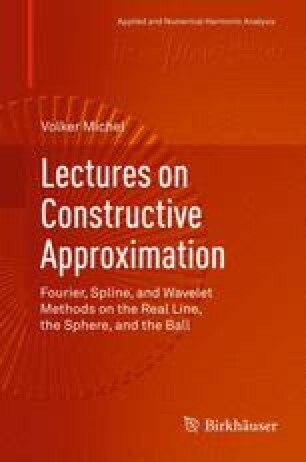 In this section, we will study the spherical wavelets introduced by W. Freeden, M. Schreiner, and U. Windheuser in [66, 74, 77, 200], which have been applied to numerous geodetic and geophysical problems and have been adapted for several other classes of tasks (e.g., the approximation of vectorial and tensorial functions) since their introduction. These wavelets have similar features in comparison to Euclidean wavelets, although several aspects become more complicated in connection with the change of the geometry and the underlying orthonormal basis. An essential tool for an Approximate Identity is again a convolution.